H&M has reclaimed its position as world’s biggest user of organic cotton, according to Textile Exchange’s annual organic-cotton market report. The Swedish retailer, which held the title in 2010 and 2011 but was outstripped by the Dutch-owned C&A in 2012, is back at No. 1 for 2013. Nearly 11 percent of the cotton H&M used in 2013 was certified organic, up from 7.8 percent in 2012. Other top buyers include C&A in second place, followed by Puma, Nike, and new contenders Decathlon and Tchibo. Lampa says that the company is also investing in the use of recycled cotton and “Better Cotton,” which is grown as part of an initiative to reduce water and pesticide use. “All together means major improvements for people and the environment and makes clear business sense,” he adds. There’s one list where H&M isn’t entirely victorious, however. Stanley & Stella, Target, and Coyuchi snagged the top three spots in Textile Exchange’s ranking according to growth. H&M sits above C&A and Inditex, but below Puma, G-Star Raw, and Williams-Sonoma, at eighth place. H&M has reclaimed its position as world's biggest user of organic cotton, according to Textile Exchange's annual organic-cotton market report. The Swedish retailer, which held the title in 2010 and 2011 but was outstripped by the Dutch-owned C&A in 2012, is back at No. 1 for 2013. 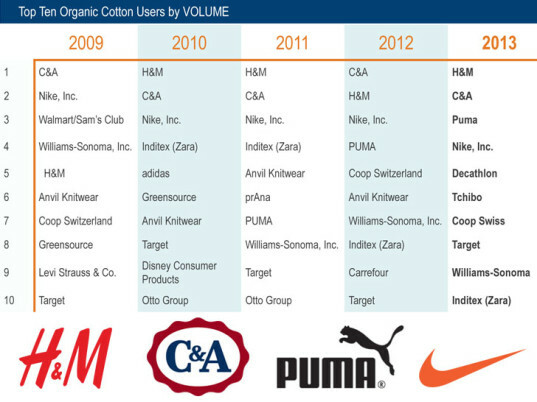 Nearly 11 percent of the cotton H&M used in 2013 was certified organic, up from 7.8 percent in 2012. Other top buyers include C&A in second place, followed by Puma, Nike, and new contenders Decathlon and Tchibo.